Dr. Dina has enacted a new plan, Freedom Grow, to help free prisoners of weed (POWs), and cannabis enthusiasts everywhere can help. Dr. Dina, a.k.a. The Real Nancy Botwin is the expert cannabis consultant to the stars. She took time out of her busy schedule to talk with me about pot prisoners, Snoop Dogg and the television show, Weeds, which was very loosely based on her life. Over the next few weeks, be on the lookout for more articles featuring the amazing Dr. Dina, complete with unique stories and challenges she’s faced on her way to becoming the cannabis queen that she is today. To kick things off, we’re talking about one project Dr. Dina is especially passionate about; Freedom Grow. Along with the organization’s President Stephanie Landa Longhis, this non-profit organization works to help free prisoners of weed (POWs). After learning the struggles associated with truly freeing a prisoner, the women adapted Freedom Grow to free those they could, while still supporting those they couldn’t. Over 3,000 people are currently sitting in prisons, all across America, facing life sentences for committing victimless crimes associated with cannabis. Some charges are as simple as transporting cannabis across state lines, but still they sit in jails wasting away, costing taxpayers thousands of dollars, when they’ve posed no threat to the public. Stephanie Landa, a medical cannabis cultivator, avid philanthropist and Dr. Dina’s “Fairy Pot Mother,” began Freedom Grow after being arrested at 60-years-old, and spending five years in federal prison, for growing cannabis that she donated to compassion programs. While incarcerated, Landa was exposed to a world she had never known, where even the bare necessities, like toothbrushes and toilet paper, could not be taken for granted. After Landa was released from prison, she and Dr. Dina came up with a plan to not only help POWs gather clemency letters to gain their freedom, but also provide them with commissary money, so inmates can buy things like shower shoes, toothpaste and typing materials to write their own clemency letters. The non-profit organization, Freedom Grow, helps to provide pot prisoners with the essential items we take for granted every day. Because the incarceration numbers for non-violent cannabis offenders are so high, Freedom Grow is currently working to help those prisoners serving sentences of ten years or more, but truly offer their support to as many POWs as they can. As word of Dr. Dina’s good deeds spreads throughout prisons across the country, more and more POWs are coming forward, asking for Freedom Grow’s help, both financially and with the collection of clemency letters. 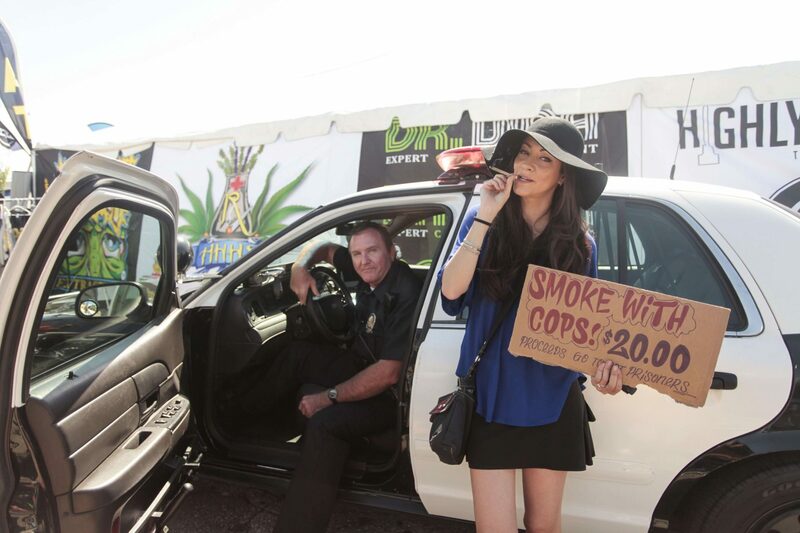 To keep up with demand, Dr. Dina gets creative with her fundraising tactics, including offering cannabis enthusiasts the once-in-a-lifetime opportunity to climb into a police car and spark up with a patrol man. Dr. Dina is challenging every cannabis business and enthusiast to do their part and help to support our incarcerated friends. More than likely, you know someone who has been affected by a non-violent cannabis arrest and now is your chance to help those who are unjustly facing absurd prison sentences. Money isn’t the only way you can help. For an inmate to be granted clemency, thousands of letters must be written on their behalf to authority figures who have the power to grant an inmates’ freedom. If you see Dr. Dina or any of the Freedom Grow team at cannabis events, be sure to stop by and sign their petitions. Stay tuned to HERB for more exclusive information about Dr. Dina and the miraculous ways she is enhancing the cannabis community. Have you donated to Freedom Grow? Let us know on social media or in the comments below.